Transforming an asana practice into an elegant, well-connected flow isn’t just for advanced yogis. 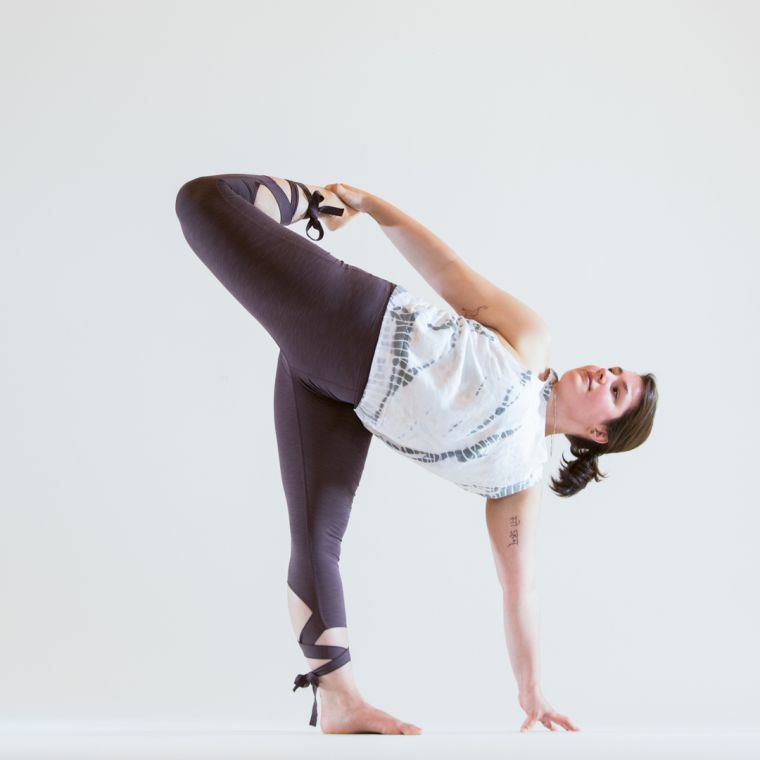 In building poses from a strong foundation—by engaging your spiritual and physical core, using breath and gaze, and incorporating new ways of moving into and transitioning between those poses—you can develop a more fluid practice, regardless of your level, and develop the confidence of a smooth operator. The suggestions described below aren't just about helping you look and feel more graceful. The most significant benefits of utilizing these techniques are in the ways they will enhance your safety and strength during practice! Authentic asana cannot be faked. Sure, your practice can be made to look like butter from the outside as you melt from pose to pose. But if, on the inside, you are hyper-aware, critical, or trying to appear perfect (despite being in physical pain, for example), you have denied yourself some of the greatest gifts that yoga offers: tranquility of mind and union of mind, body, and spirit. Giving more emphasis to your soul, spirit, and purpose than to your appearance will bring grace to your movements faster than any technique, because it builds gracefulness from the inside out. The added support that comes from such an emphasis is the difference between doing and experiencing. I’ll often ask my classes to move through a vinyasa while keeping their minds and hearts set upon a person or cause toward which they’d like to send positivity. That vinyasa usually differs dramatically from others we’ve done that day. Students cut the tethers to surface distractions, settling into their centers. They go to the core of what really matters to them, and that focus lends more grace to the vinyasa. It’s a beautiful thing to watch. How might our asana change throughout our entire practice if we made that kind of connection to both our inner selves and our purpose? To discover this for yourself, begin small—with just one spirit-driven vinyasa—and then build on that foundation to bring a soul focus to the full length of class. When we want to achieve grace in our movement, building it from the core of our bodies is as essential as building it from the core of our beings. We can do that by adding to our practice a deeply physical focus: using our core muscles. Just as petals grow outward from a flower’s center, we can “grow” our limbs outward using the strength at our core. Here’s an example of how a pose (or our bodies in the pose) can suffer if we don’t bloom from our center. In variations of standing hand-to-big-toe pose (utthita hasta padangusthasana), students will often put their strap under their foot and then attempt to lift their straight leg, in a locked-knee position, directly up in front of them. This usually causes their torsos to lean back, out of alignment, making the pose something of a “tug of war” between the extended arm and leg. If they do not bend the knee of the strapped leg toward the belly before extending the leg, they might not garner as much support from the deep core musculature, using instead the hamstrings and lower back to pull the leg up (ouch). I teach a similar core-engaging movement in the transition from lunge to standing splits (urdhva prasarita eka padasana). Try this: From low lunge, walk the hands slightly forward on the floor, and shift more weight into the front leg. Then, instead of kicking the back leg straight up into the air behind you, bend the back knee to bring the heel toward the sit bone and the knee slightly in toward the belly. Pause here for a breath and then extend the leg; and with toes spread, press the ball of the foot toward the ceiling. This preliminary bending, as in standing hand-to-big-toe pose, may allow more muscles to “get on board” in support of the upward extending leg. You might even find that the leg actually extends higher with the added support garnered by blooming from the center. Body and breath, in most asanas, should move together (the exceptions being the suspended-breath transitions of certain yoga styles and some advanced breath/asana exploration). For the most part, the breath is ideally the initiator of movement. Leslie Kaminoff, my go-to teacher when it comes to breath, offers another way to look at the breath: as a layer of support for the body. Basically, our lungs take up space and shape the torso differently, based on whether we are inhaling, exhaling, or holding the breath in/out. So it makes sense to choose our way of breathing depending on the movements we are performing. I like to think of the lungs as pillows of air that change the shape of the spine, rib cage, and organs, depending on whether they are inflated or deflated. Try this: Move into a standing forward fold (uttanasana). Exhale completely, and hold the breath out as you rise to mountain pose (tadasana); then, once you are there, inhale. How did your body feel? Now, go back into the forward fold. This time, take a slow, deep inhale (as you normally would) as you rise to mountain pose. The difference in your breathing can greatly affect how the movement feels. There are numerous poses and transitions in which breath support can be integral to safety—and, at the very least, can provide added ease to your movements. As you practice, mentally connect to your lungs and experiment with your inhalations and exhalations in order to discover what feels best. Even changing the rate of your breathing can greatly affect the feel of the pose. 4. Build Me Up, Buttercup! ‌Including the gaze (drishti) as a foundational element of a pose can be the difference between balancing and falling. 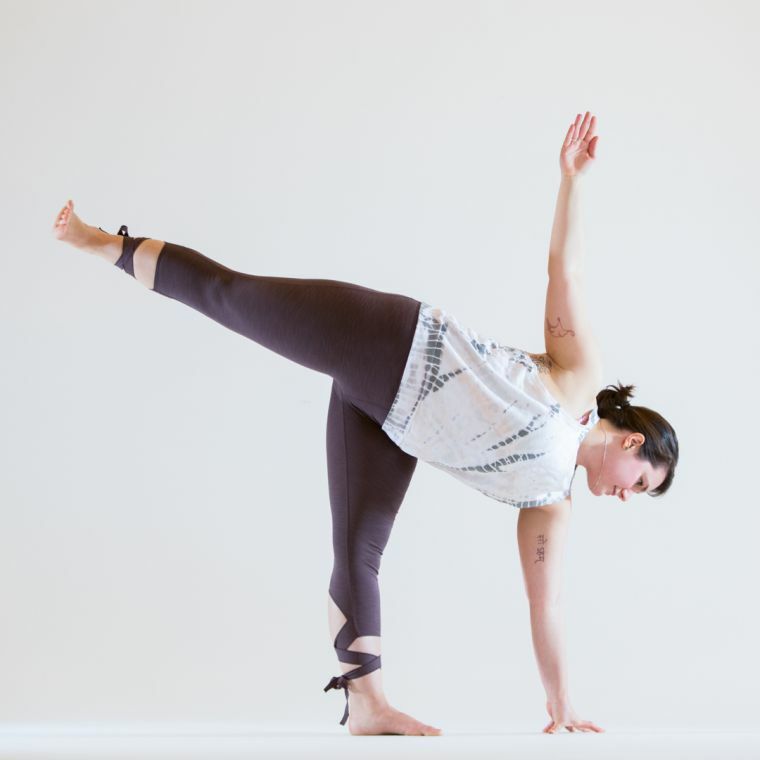 Try this: Move into half moon pose (ardha chandrasana) and turn your gaze up to the sky. Now, bend your top leg and take the bind (chapasana). Once finished, release the pose and come back to standing. Now, move back into half moon pose, and before you take the bind with the back leg, look down at the floor to set your gaze. Now bind. Now look up. You’re likely to feel more stable. ‌In addition to this foundational gaze, building a pose piece by piece can also help to create stability. Physically forming one part of the pose you are moving into (before fully completing the posture) can really smooth out your practice. This also allows you to land your postures more gently and deliberately. As an example, try this: From uttanasana, instead of simply stepping back into a lunge by extending one leg and then bending the front knee to form the lunge after that extension, bend both knees into a deep chair pose (utkatasana), with your fingertips on the floor or blocks. Keep that deep bend in one leg; then step the other leg back to complete the lunge. Doing this will require more work in the leg and hip muscles, allow for more balance, and keep you lower to the ground so that there’s less stress on the joints of the knees, hips, and spine as you land the lunge. Grace is attainable for everyone—both on and off the mat. These four suggestions offer just a fraction of the innumerable opportunities we have for polishing our practice. Of course, not every class will be free of wobbles or falls (and deleting those entirely is not even the goal). But by applying the above principles, you are sure to experience more fluid maneuvering, especially through transitions. And if we can transition smoothly on the mat, perhaps we can operate smoothly through our transitions off the mat as well!